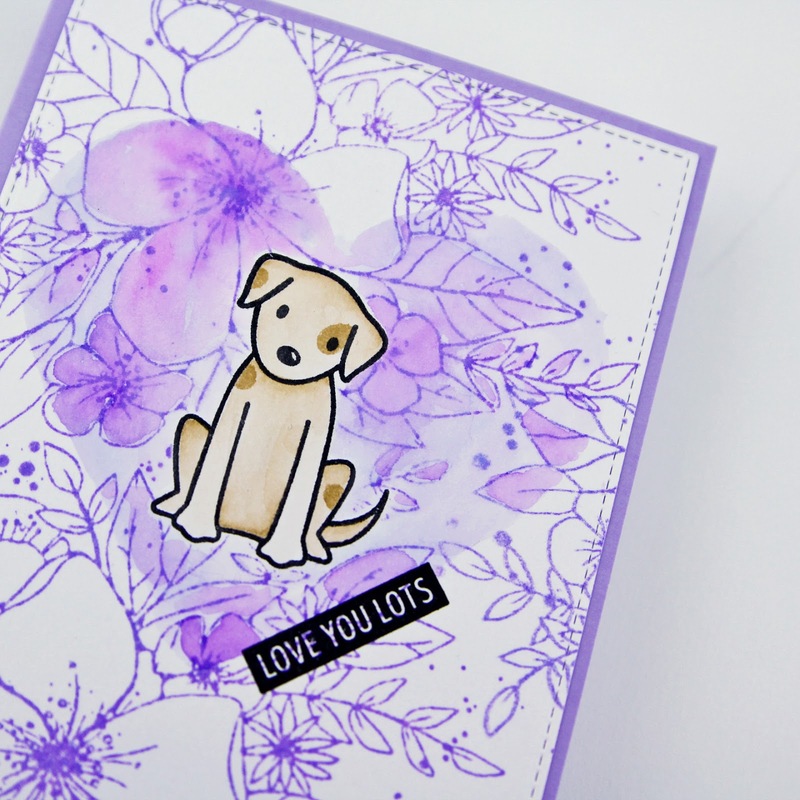 carly tee: cardmaking for a good cause! I was so honored when Sandy invited me to be a part of this amazing hop she was putting together! Encouraging us cardmakers to use our talents for good? What an amazing idea! My mother-in-law has the biggest heart of anyone I know so it was easy to decide that I wanted to do something in her honor. The hardest part of this project was choosing a charity to donate to. There are so many wonderful and deserving causes! With help from my husband, we settled on one that we knew my mother-in-law would love, PAWS, a wonderful organization that advocates for the rights of animals. Their motto is people helping animals and my mother-in-law has rescued two abandoned puppies! I know she would adopt more if she had room! 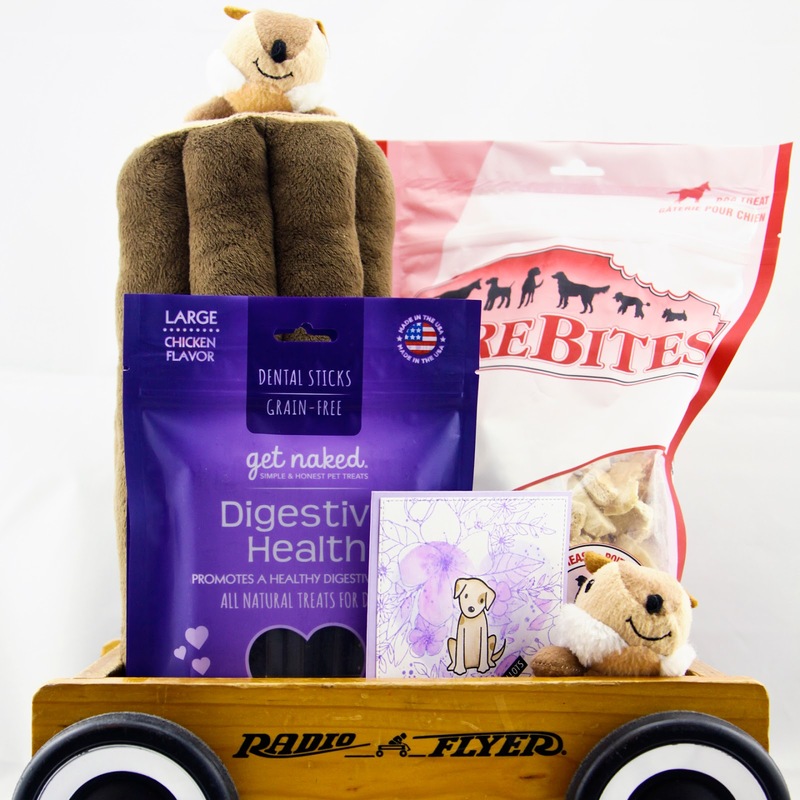 We donated to PAWS in her honor and decided to create a little gift basket for her dogs, including treats, toys & a little card. And I decided to go purple because my mother-in-law LOVES purple. And p.s. PAWS did send us a sweet card to give to my mother-in-law but it didn't match my purple theme, LOL! To create this card, I started by stamping the pup on Smooth Bristol cardstock and again on masking paper. 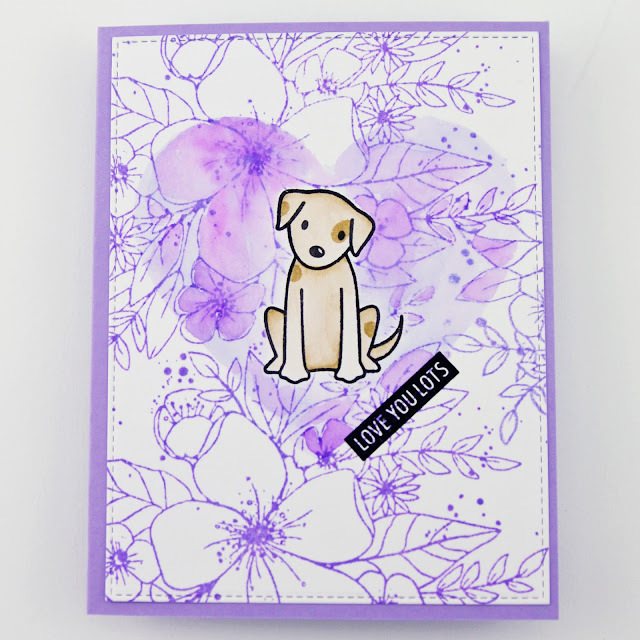 With the pup masked, I stamped the flower repeatedly to create a background, using Distress ink. Next I created another mask by die cutting a heart from masking paper sized to fit my card front. After applying the mask, I applied a messy watercolor to the flowers withing the heart (with the puppy still masked too). Then I removed all the masks and colored the pup with Clean Color markers. 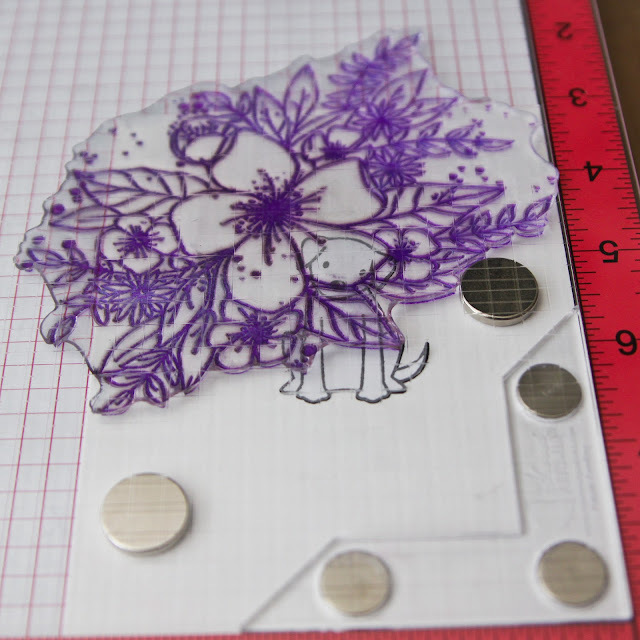 The finishing touches were to die cut the panel with a stitched rectangle, stamp a sentiment next to the heart like a tag and mount to a purple card. And remember I said there were prizes? Well there are some awesome companies helping inspire you to hop along and leave comments on all the blogs - Altenew ($30), Lawn Fawn ($50), My Favorite Things ($25), and Ellen Hutson ($25)! Be sure to go say thanks to them on their social media for helping get the word out about giving…and leave comments by Wednesday March 22. Winners will be announced on Sandy’s blog on Thursday March 23, along with a total amount we’ve raised together! Thank you Sandy for this fun opportunity to create for good! And keep hopping with May Sukyong Park ! Darling card. What a great way to honor your husband's Mom. Adorable! Your mother in law is lucky to have a daughter in law who is so thoughtful! I'm sure your mother in law would be proud. Thanks for contributing during a great hop and thanks for the thanks to win- love purple, it looks great. Thanks for sharing about PAWS. Great gift to honor your MIL too. Love this! Super cute card. Love the charity you have chosen. What a nice way to honor your mother in law. I want to mask as well to add water color backgrounds and your post has been so inspiring. I love the pup and I love the organization you chose. Best of Luck and have a wonderful day! Wonderful card! Thanks for sharing your charity choice. What a. Beautiful card and I love the organization PAWS! Thank you for participating in the charity blog hop! Aww, love anything doggie related. We currently have 4 we rescued. Cute card and a great background. What a cute card!! Such an excellent idea to honor your mother-in-law...she will love it!! I love the purple an dhow you made this card. I never would have thought of making the card like this and I love the heart in the middle. Paws is such a great charity to. what a beautiful card to recognize your MIL and cute gift basket, too. :) her pups will love all of it! this is such a fun blog hop!!! I love the masked heart concept: subtle but so lovely. You must be almost as perfect as my own daughter-in-love (best day's work my son ever did!). Thanks so much. I absolutely love this floral + puppy combo - and hearing about your choice of charity as well! We are big animal lovers here (3 rescue dogs... only because that's the limit! lol!) and always love supporting animal rights & groups who help animal friends. Love your adorable card. Great background. Such a cute card! Love the puppy. Great charity & darling card. Love the basket you put together for your MIL & I love this hop! This is a great charity!! I love your adorable card. The purple is fantastic and the way you masked the heart is fabulous!! Great design! Cute card with the spotlighting. This is so cute! Dogs are my fav. Nice background and that puppy is so cute. Thank you! adorable for a good cause! Puppies, hearts and flowers... usually puppies love digging in the flowers, I like your take on it better!. Sweet card. Such an adorable card, and I love the Paws charity! Adorable card! Thank you for participating in this charity blog hop. I've rescued four doggies and a kitten. Three doggies were from previous owners who needed to find homes for these lovable dogs. Our latest 4 mo was from a rescue shelter. The kitten was from a litter found by a friend who needed to find homes for them. It breaks my heart to know that there are dogs and cats that don't have anyone to give them a home and give them love. If I could, I would adopt many more! I like your background technique, very cute card. Great background, I don't think I would have thought of combining those techniques. Really interested techniques - like the heart mask idea. Wonderful use of masking on this card to create the floral background and the heart around the cute pup. So sweet! What a great cause to support. Your MIL will be honored. Such a cute card & a great cause! love the puppy. You are a great DIL! Darling card for your purple- and PAWS-loving MIL!! Cute card in my favorite color! Very cute card! PAWS is a great organization and purple was the perfect color choice! A pretty background to highlight that sweet little pup. Such a cute card. Love the puppy! What's not to enjoy when you have puppies and flowers in one place? Love your card, and your heart for those sweet homeless animals! adorable little card. Don't know what I'd do without my little companion. This puppy is just adorable!Love it! I love your idea of just watercoloring within a defined shape! Subtle yet effective. Animal rights is greatly important to me and my family, thanks for the info on PAWS. We are a rescue family, so PAWS is dear to our hearts! Cute card! Thanks for the inspiration and for the opportunity to win! I love this! I love any animal cause, and this little pup card is perfect. I'm certain your Mother in law will cherish this gift! Such a fun card!Thanks for sharing the technique. This is super cute! I love how you masked the heart; very soft and subtle. And it sounds like your gift is the perfect match for your mother-in-law! So . . . I'm a little partial to anyone who loves dogs! My Newfoundland Jemima has been a blessed companion for over six years now and I can't remember what life was like without her. You card is both beautiful and emotive. That little dog gives out a lot of feeling. What a cute gift idea. As Bob Barker always says " don't forget to spay or neuter your pets". I love PAWS! Great card. Thank you for participating in this amazing Blog Hop! Sandy is something, isn't she? I love your card and the colors are so pretty. Thanks for sharing about PAWS. Dogs own my heart, they are so much better than people! Adorable card. I'm sure your mother in law will love it. Thanks for teaching me about a new charity too. Love your card and love he purple theme. Gave me some great ideas. Soooooo love the donation to charity paws too!!!!!! We rescue pitbulls so I am all about the doggy charities. Aww! Love this super sweet card! Great card. Love the puppy and the purple. Great charity! Love the card! Beautiful! What a clever background idea. Pinned this one ! Sweet, Sweet Card!!! Awesome Charity!! This is such a sweet card, and such a sweet thought from you for your MIL. Sweet card, and I love your gift basket! This such a beautiful card! I love the colors and I love the way you used masking to create it all. Plus that charity sounds awesome!! What a wonderful idea ! My family has donated to Habitat for Humanity, the Heifer Fund and Oxfam for years. All good charities! This is a great opportunity for your readers to discover some new and worthy charities! Great card with a wonderful cause! Love your technique. Wow, I am liking finding out about all these charities and seeing the nice cards. I look forward to checking out all the blogs! Adorable card. Need to try the masking technique. Great cause- I LOVE my two rescue dogs. What a gorgeous card!!! And how sweet of you to do this for your MIL! I think your MIL will be excited. Great job. I definitely need to research into this charity more! Your card is absolutely beautiful and I love how you did something in honor of your mother-in-law. Such a sweet card to go with the basket for your mother-in-law. I like the heart shape in the background. beautiful card! 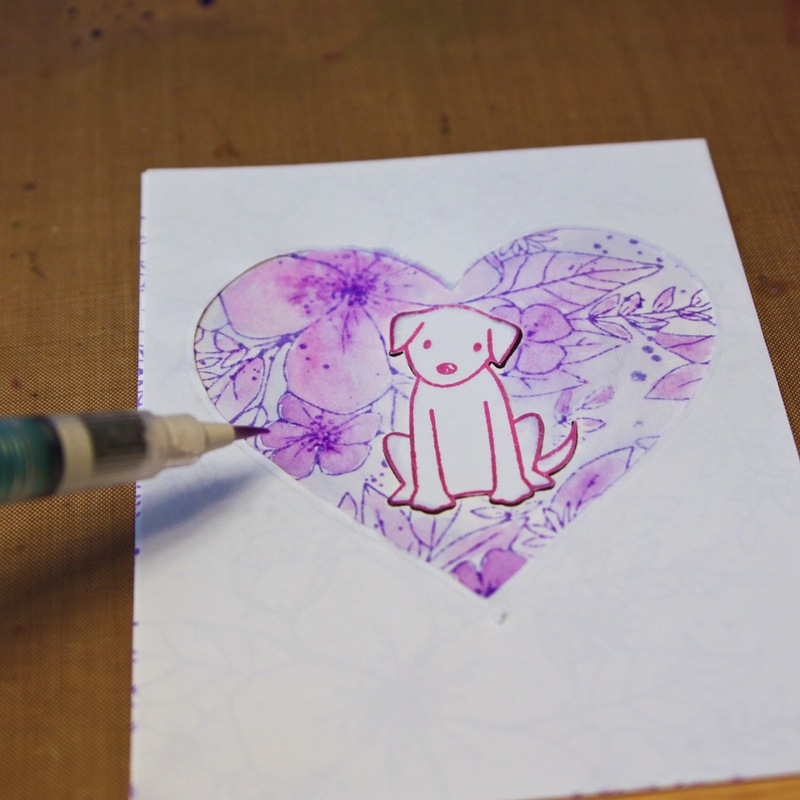 The puppy is so cute, and I love the watercolored heart in the background! Very cute puppy and card! PAWS i such a great charity! And that card and gift are utterly charming! I love the design of this card! The heart is subtle- love it!